In the short span of a few essays, this book takes the reader on a trip from the historical roots of the current financial architecture to the imaginable futures one can envision for it, only if there is the political will to change it. If we accept that, as put by the editors, financial markets’ marginal imperfections are rather endemic pathologies, the consequences for the financial architecture have Copernican proportions. Every scholar and practitioner interested in the problems posed by the global economy at a critical moment when it has reached what looks like a dead end, will appreciate the refreshing inspiration offered by the authors that a star editing team has put together. Aldo Caliari, Director, Rethinking Bretton Woods Project, Center of Concern. Juan Carlos Moreno Brid, UN Economic Commission for Latin America and the Caribbean. He is Professor at the Faculty of Economics, UNAM, Mexico. As the book authors argue, the financial institutional settings were profoundly modified in the 1970s, imposing new instruments, new mechanism, new institutions that revolutionized the world of finance, missing a central characteristic: financial regulations. 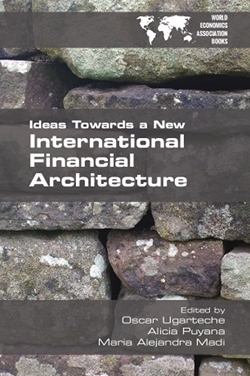 In this context the book’s conclusions are of outmost importance: taxes on financial activity, new ways of financial accounting, sovereign debts regulators as the new central bank supervisions are vital to overcome the present crisis and set the grounds for a new period of economic growth and development. Noemy Levy, Professor at the Faculty of Economics, UNAM, Mexico. Since the last 2008 economic crisis the implementation of a new financial institutionality is taking too much time, showing the current correlation of power. The discussions at multinational level require more action and inputs as those in this book. Congratulations! Katiuska King Mantilla from the Government of Ecuador.